We're looking for our next slate of leaders. 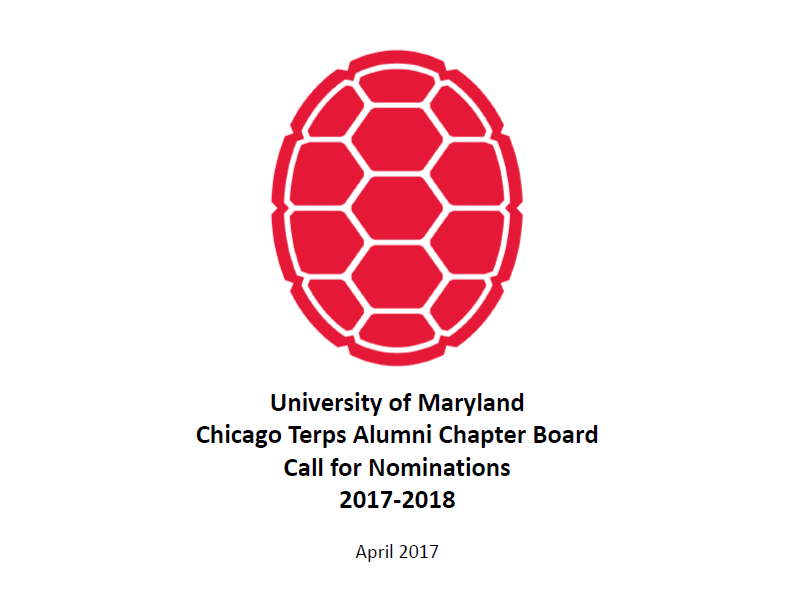 Thank you for your interest in joining the Chicago Terps Alumni Network Board. Here you'll find information on the board nomination process, board position descriptions and current board needs. As a board member, you'll play a leadership role in our organization. You'll enjoy working with several generations of alums to engage fellow Terps. Candidates will be selected each June for one- or two-year terms. Alumni or individuals with an interest in furthering the strategic direction of the board and branding of the university, or with experience in boards, fundrasing, event-planning, development or marketing are encouraged to apply. Individuals can be nominated or self-nominated. The following is requested: If you're interested, review the criteria below and submit a resume and a brief statement of candidacy no later than May 12, 2017 to Network President Nichol James at nichol.james.terp@gmail.com. Can I be elected to the board if I'm not in Chicago proper? Yes, anyone from the Chicago area may apply. Board meetings are held in-person and by teleconference, and we hope to expand our programming out into the suburbs and collar counties. Who can sit on the board? Anyone with an interest in promoting the University of Maryland. What's the length of a term? Nominees may be offered a one- or two-year term. What's the time frame for this whole process? The window for nominations will be open from now until May 12. From there, chosen board members will be notified no later than June 1. The terms begin when members are inducted on July 1. Officers serve in an executive capacity for the board, and the positions require the most time commitment. The president is responsible for planning and providing direction to the board and committees. He or she presides at all board meetings and represents the chapter at all school-associated functions. Term length: Two years. Hours required per month: 10-15. The vice president provides planning support to the president. He or she assumes all presidential duties in absence of the president. Term length: Two years. Hours required per month: 10-15. The past president serves as advisor to the board and chairs the nominating committee. The treasurer is responsible for maintaining accounts, financial records, and the submission of an annual budget. Term length: Two years. Hours required per month: 5-10. The secretary is responsible for scheduling board meetings, preparing agendas and minutes, managing social media and maintaining records of board communications. Term length: two years. Hours required per month: 5-10. These members of the board attend chapter meetings and other functions. They serve on task forces and committees as determined by the board officers. Term length: One or two years. Hours required per month: 3-5. © 2017 Chicago Terps., ALL RIGHTS RESERVED.